On Monday I shared the doll quilt that I made for my daughter for her birthday. Today I'm sharing the doll diapers and wipes that I made for her. My aunt gave her a small Cabbage Patch Kid for Christmas, and my daughter and her doll "Lena" have been inseparable every since (which is new for me because I was never into dolls as a kid and my oldest isn't either). These were such a quick sew. 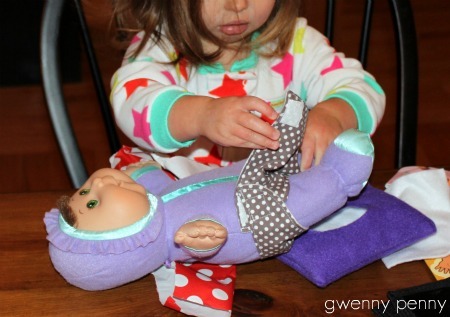 I used this tutorial from Skip to My Lou for the diapers, but I had to modify the template to fit my daughter's doll. Just print the template, cut it out, and wrap it around your doll to see how it fits. I just trimmed the template until it fit properly. Gwen, I love it! 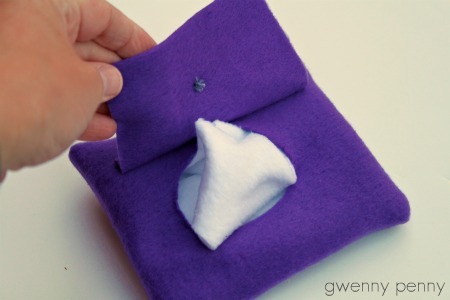 This is a great project and what little girl would not love to have these for their own baby. They are always imitating us and this is another way to play house. I have fond memories of making things for my own daughters' Cabbage Patch Kids. Thanks for a smile so early in the morning! Your daughter is so cute! 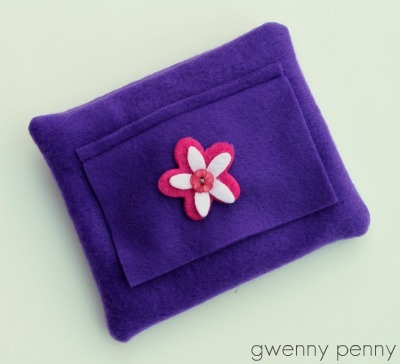 It must feel good to make and give such pretty and well-loved gifts. You're awesome! Great project. If I ever have a daughter, she'll have these. Those wipes are so cute. I was a total baby doll kid. I still have most of my dolls and all their gear from my childhood, thanks to my mom. My oldest daughter wasn't very interested, but my second one loves her dollies. I must admit it's fun for me also. So cute! I would have loved this when I was a little girl. I'm definitely saving this for future reference. Thanks for sharing! My husband and I just bought CPK for our nieces, so now I'll have to dig out my sewing maching to make them diapers! This is the perfect handmade gift.